When you buy a coin, a medallion, a medal or another badge of honor from us, then you may rest assured: every item which we sell corresponds to its description and we guarantee its authenticity to the full price of purchase, with no time limit! In order to offer you this security, we employ all of our attention to detail and our experience. Every coin and every medal is precisely and clearly described before its sale. The condition and degree of preservation of coins and medals are judged by these numismaticians according to strict and generally recognized criteria. 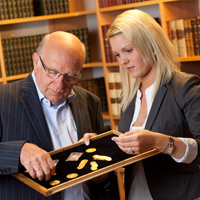 In investigating authenticity, we work together with renowned scientific institutions and numismatic collections. Only in this way are we able to offer highly valuable and painstakingly inspected coins, medals and badges of honor. Our Künker Guarantee is based on these high standards in the appraisal of coins, medallions and medals which we offer for sale. For you, this means the highest standards in security and dependability when you buy – and we take great pleasure in bringing customers extraordinary satisfaction! This is our promise: if you should ever be dissatisfied, you may rely on our fair and obliging attitude in response.